Image caption Russia has been accused of targeting hospitals, which Mr Kerry said was "beyond the accidental"
Russia and the Syrian government should be investigated for war crimes, US Secretary of State John Kerry said. "Russia, and the regime, owe the world more than an explanation about why they keep hitting hospitals and medical facilities and children," he said. "These are acts that beg for an appropriate investigation of war crimes." Moscow has repeatedly denied attacking civilians, and said it targets terrorist groups in Syria. Mr Kerry, however, said Russian and Syrian government attacks on hospitals were "beyond the accidental" and part of a deliberate strategy in war-torn Syria. "This is a targeted strategy to terrorise civilians and to kill anybody and everybody who is in the way of their military objectives," he said. 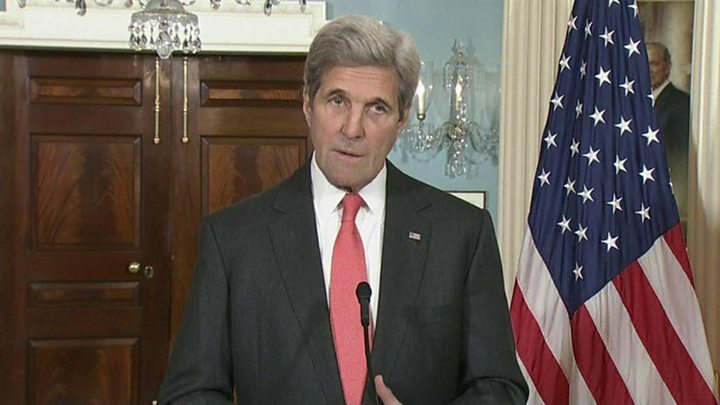 Media captionUS Secretary of State John Kerry says Russia and the Syrian government have a strategy to "terrorise civilians"
Mr Kerry was speaking in Washington at a news conference with the French Foreign Minister, Jean-Marc Ayrault. Mr Ayrault is in Washington before a meeting of the UN Security Council, where he will present a plan for a further ceasefire to try to get humanitarian access to the divided city of Aleppo. But Russia's deputy foreign minister, Gennady Gatilov, said France's draft was unacceptable on a number of points and politicised humanitarian aid. US and Russian talks on the crisis have cooled after the breakdown in a ceasefire brokered in September. Both sides blame each other for the collapse. 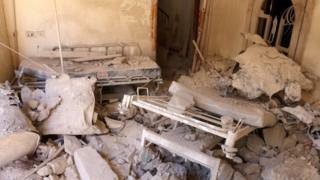 The UN's Emergency Relief Co-ordinator, Stephen O'Brien, recently said medical facilities in east Aleppo were being destroyed "one-by-one". Patients are being turned away, no medicines are available to treat even the most common ailments, and the number of people requiring urgent medical evacuations is likely to rise dramatically with clean water and food in very short supply. The Syrian American Medical Society said the area's largest hospital had been forced to close in the early days of October following a barrel bomb attack. The group blamed Russian and Syrian forces for three separate attacks on the hospital within a week. Several staff were reported dead. "The hospital is now not usable at all," said Adham Sahloul from the group, which supports the M10 hospital. "It is not salvageable," he told the AFP news agency. Earlier on Friday, Russia's parliament voted to approve an "indefinite" deployment of forces in Syria at the Hmeimim airbase. The facility had been supporting Russian troops since August 2015 on a temporary basis, but Friday's vote could lead to a permanent base. Russia has also been openly criticised by German leader Angela Merkel, who said it should use its influence in Syria to "end these heinous crimes". Mr Kerry's remarks come hours after Russia said it was ready to back a new UN plan to end violence in Aleppo. Staffan de Mistura, the UN's special envoy for the Syrian crisis, appealed for fighters from the rebel group Jabhat Fateh al-Sham - formerly known as the Nusra Front - to be able to leave Aleppo with their weapons. Eastern Aleppo, held by rebel forces, has been subjected to a constant campaign of air strikes by Syrian and Russian forces in recent weeks. About 275,000 people still live in the eastern part of the city. He said he was prepared to personally accompany the jihadists out of the city if it would stop the fighting. Russia's Foreign Minister, Sergei Lavrov, backed the plan "for the sake of saving Aleppo." The jihadist faction, however, has already rejected the proposal as a "surrender". Russia and Syria say their forces are attacking Jabhat Fateh al-Sham. Western powers dispute this, pointing to the high proportion of civilians being killed. Mr de Mistura said only about 900 of the estimated 8,000 fighters in eastern Aleppo were members of Jabhat Fateh al-Sham.